On July 30, 2015, a stabbing took place in Jerusalem’s gay pride parade taking the life of 16 year old Shira Banki. Just a day later, a molotov cocktail was thrown into a home in Duma, a village in north West Bank, taking the lives of an entire family. These violent incidents immediately followed a wave of inciting statments by public Israeli figures against arabs and homosexuals. 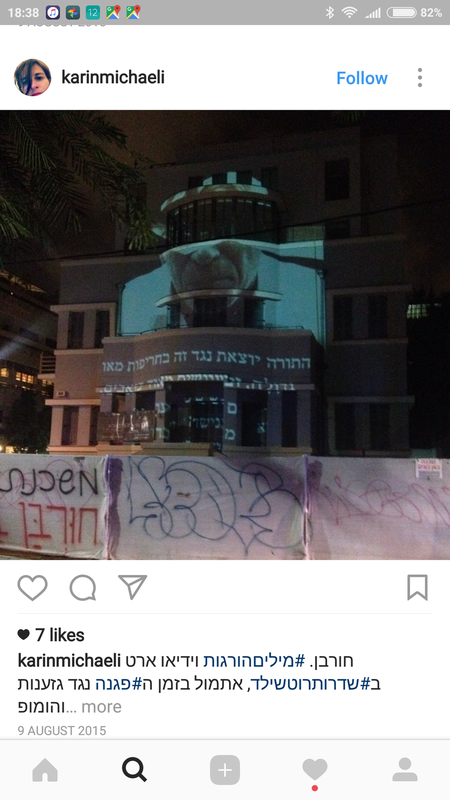 About a week later, I paired with artist Ben Livneh Weitzman, and on August 8th we projected a video loop on building facades on Rothschild Boulevard and on the symbolic Metzudat Zeev (headquarters of the right wing Likud party), both on the route of a protest march against the violent atmosphere in the country. A day later, at exactly 8:00 PM, together with friends and volunteers, we simultanously projected the video loop on building facades at Zion Square (Jerusalem), Rabin Square (Tel Aviv), and other central locations across Israel. In addition, we filled the adjacent streets with hundreds of posters while at the same time using the #wordskills hashtag on social platforms to urge users to print out and put up the shared posters or publicly screen the video with whatever means available. The action was also featured in Timeout Tel Aviv (13.8.2015). The aim of this project was to draw attention to the inflammatory statements given by public leaders, which flooded and still floods the political Israeli discourse. The project was also a call for action: we used the hashtag and published the graphic material on the event’s page to promote an open-source participation of the public. On both days of the action, we saw public participation in the form of additional graphic material created by other users and shared on facebook, as well as posters hanged at additional cities. The event’s page was also a platform for a vibrant discussion during the following days and users on both Facebook and Instagram were using the #wordskill hashtag in their posts. Special Thanks: Micaela Terk, Yotam Shibolet, Adi Djerassi, Nitzan Yulzari, Ido Nahari, Evyatar Baram, Noam Herman, Nevo Shirazi, Shir Sternberg, Noa Urbach, Shahaf Weisbein, Ziv Gidron, Yuval Amir. August 9th, #wordskill projection at Rabin Square, Tel Aviv. All projections across Israel started simultaneously at 8pm. 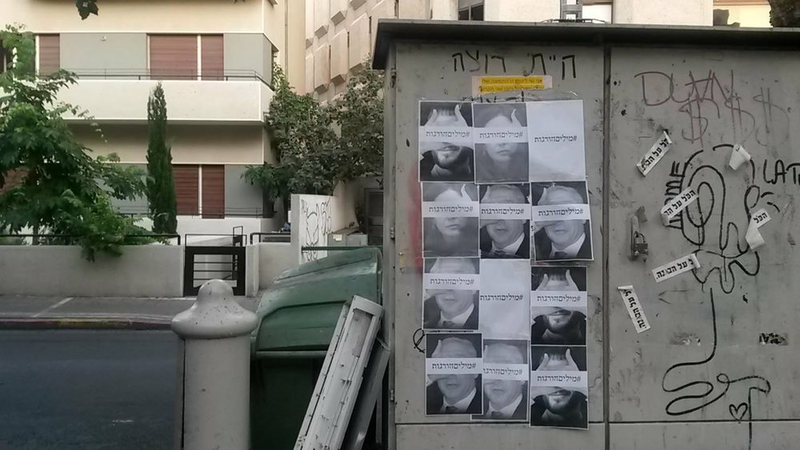 August 9th, posters at Rabin Square. August 8th, #wordskill projection on the symbolic Metzudat Zeev (headquarters of the right wing Likud party) during the protest march. On both days of the action, we saw public participation in the form of additional graphic material created by other users and shared on facebook, as well as posters hanged at additional cities. The event’s page was also a platform for a vibrant discussion during the following days and users on both Facebook and Instagram were using the #wordskill hashtag in their posts. The action was also featured in Timeout Tel Aviv (13.8.2015). The public participated in vaious way: Protesters/Users karinmichaeli and kerenmk shared photos of the projections during the protest march and used the #wordskill hashtag on instagram; user Avishay Rubin made a poster using the published graphics material; user Shaked Rozen posted photos showing the posters she printed out and put up on Herzl st. in Rehovot, Israel.